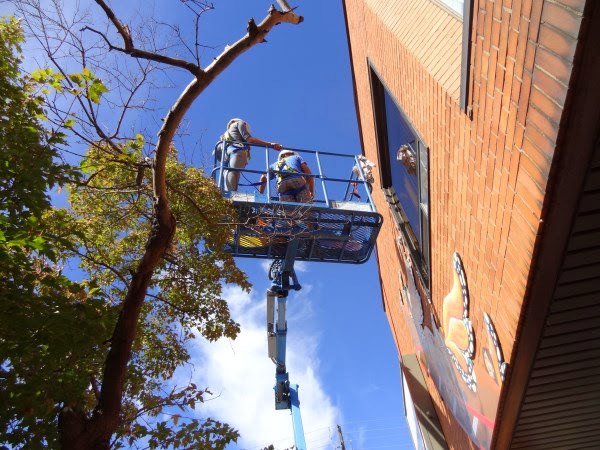 Mural Routes is excited to partner with the Street Art Toronto for the second year to offer subsidized Working at Heights training for mural artists. We will be offering several opportunities for training over the course of the summer, as part of our Wall Art Learning Series, with the first coming up on Saturday, May 6th, 2017. See below for full details and registration. Each offering will be a full day course, at the end of which participants will receive Ministry of Labour-approved Working at Heights Certification, valid for three years. Working at Heights Certification is required in Ontario when a worker’s feet are higher than 6 ft above the ground. For more information on Working at Heights standards please visit the Ministry of Labour’s website. Questions? Contact natalie@muralroutes.ca or 416-698-7995. Our sincere thanks to StreetARToronto for their generous support, which has enabled us to offer this workshop at a significantly discounted, accessible price. The Wall Art Learning Series is part of The Mural Art Learning Institute (MURALI), a continuum of training programs in all aspects of mural making. MURALI is generously supported by the Ontario Trillium Foundation.